Kate, tell us about this adventure. 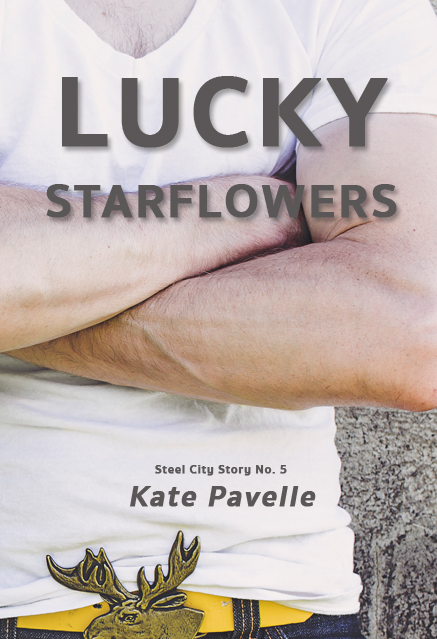 Kate: Hi everyone, I’m Kate Pavelle and I wrote “Lucky Starflowers.” There’s a blurb below, and I won’t go into it other than to say that it’s a gay romance adventure with a happy ending and without any inconvenient cliff-hangers. Today I’d like to lift the curtain and let you have a peek at the Self-Publishing Witch. The SPW (pronounced “spew”) is wont to promise books and stories to her readers, but she’s horrible at sticking to deadlines. This isn’t because of any kind of a writer’s block or lack of inspiration – nah, writing’s the relatively smooth part of the process. The snags come in form of beta reads, getting around to processing edits while already writing something else, arranging for a reliable proof-reader, launching blog-tours for existing releases, and making book covers. Cryselle: **eyes that cover** Wait, a narrator? There’s an audiobook? Cryselle: What was the hardest part about producing an audiobook? Kate: I didn’t know this until I started receiving other audition recordings, but I really struck gold by meeting Kevin. Finding the right narrator is hard, and I got lucky. Other than that, waiting to get the new chapters uploaded was an exercise in patience. I really loved listening to them and see how they came across! Don’t you just love those guys? Don’t you love their hair? And the flowers make it so romantic. Cryselle: Haven’t I seen that dude around? So? Did it work? Cryselle: Oh, my. That belt buckle. Does that say ‘I’m from Montana’ or what? 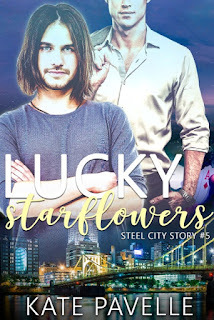 For the record, there are no characters from Montana in Lucky Starflowers. Kate: Yeah, seriously. I’d love to know exactly what his thoughts have been when he saw my cover at first! Kevin: Well I knew you’d put a lot of work into it so I didn’t want to crush your spirit, but I was confident that the cover appeared too outdated to appeal my friends. I could tell that you were including certain elements, but to be honest I thought the overexposed flowers and 90s haircuts/fashion made it rather terrible (plus I liked your original font better!). Kate: I suppose you don’t remember the glory days of Fabio. Cryselle: I don’t remember Fabio hugging on another guy. Kevin: You know, I get him and Yanni mixed up all the time! :-D No, I’m afraid Fabio was before my time but I’m sure he was a hottie back then. Anyhow, I showed your cover to a gay friend of mine and told him I didn’t know what to do or how to bring it up to you without hurting your feelings. He said to just tell you exactly that…and so I did! I’m glad I did and I’m much happier with the new new cover! I think it has all the important elements and is very appealing! The cover below is what you’ll see when you go on Amazon to buy either the book or the audiobook – designed by Emma at www.hardcandiespublishing.com. We are all happy with it, and she’s fast and easy to work with! So there you have it. Book covers are the bane of my indie existence, and if you see a lousy one on one of my titles, you can bet I decided to flex my Photoshop muscle once again! Will I stop trying to design my own book covers? Probably not. It’s too much fun. However, from now on, I promise not to stress over a book cover and just “hire it done” if I’m having a hard time. Cryselle: Aside from the cover story, who else contributed to this book? Kate: My beta reader, Jackie Keswick, was the voice of reason and spotted more than just a thing or two. My friend Sardonicista Imperfecta, who commits fan fiction with me when she isn’t practicing medicine, advised me on the nature, treatment, and healing time of various injuries. Jonathan Penn was a fabulously meticulous and timely proof-reader. Go buy an audiobook! Audible has a nice special going, and you can get it free if you are a new Audible user. Here is the link. The book is available wherever fine e-books are sold. As for other books, I’m finishing the SwimBikeRun trilogy, where the boys are giving me a very hard time. I have enough material for at least two more books. I won’t be turning it into a quintology (or a sextology, and get your mind out of the gutter! ), but there will be a few stand-alones tied to this world. My glassmaker suspense/romance “Flux” is in editing, and the cover has been commissioned and paid for (See? I may be stubborn, but I’m not unreasonable.) As long as I can keep from launching into new and shiny projects, my publishing schedule should hum along just fine. Newsletter alert: I publish a newsletter every so often. Every issue contains a free story, or a free book, plus news of my latest release. Come sign up at www.katepavelle.com and join the fun! 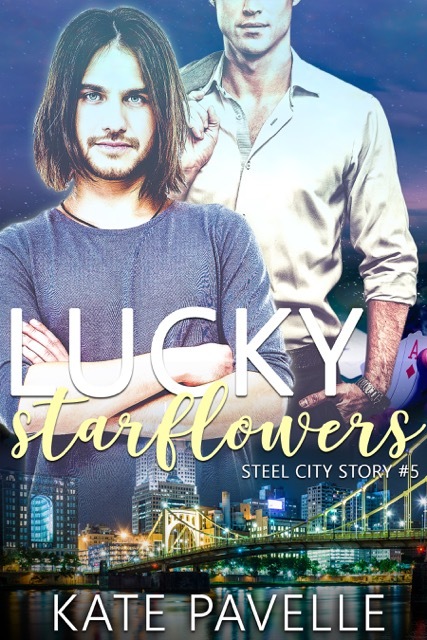 Theodore inherited Starflowers. The flower shop gives Theodore’s life meaning after a depressing breakup. Focusing on work is easy when he’s absolutely sure there’s no space for a man in his life. If he did allow for a boyfriend, it would be someone boring and everyday. Someone unlike the exotic Attila. He’d have a cubicle job, wear a cheap suit, and drive a Kia. 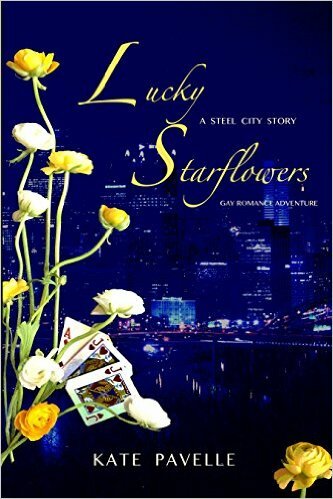 Cryselle: Just for the record, I read and LOVED Lucky Starflowers, review to follow shortly.